was heard to say, "Karmapa" at birth. This was reported to the Tai Situpa who confirmed the child to be the new Karmapa but asked the parents to keep this fact secret for three months, to protect the young incarnation. He devised a test, which the baby not only passed but to which he was heard to say, "E ma ho! Have no doubts, I am the Karmapa." He spent the next years at Karma Gon. When Michö Dorjé was five, another postulant for the Karmapa title was put forward in Amdo. The Karmapa's regent, Gyaltsab Rinpoche, set out from Tsurphu to investigate the two children. However, on meeting Michö Dorjé, he found himself spontaneously prostrating and knew that he was the real Karmapa. He enthroned him the following year. His main guru, from whom he received the lineage transmissions, was the mahasiddha Sangye Nyenpa. The eighth Karmapa had many visions during his life revealing the inseparability of his own emanations and those of Guru Rinpoche, both being the emanations of Buddhas to accomplish enlightened activity for however long their teachings are extant. Thus he saw he had been the Guru Rinpoche of the former Buddha Dipamkara and, in general, the activity-aspect of all thousand Buddhas of our universe. 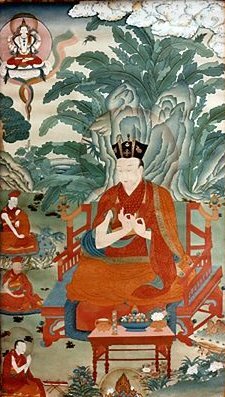 Michö Dorjé was one of the most renowned of the Karmapas, being a powerful meditation master, a prolific and erudite scholar, and author of some thirty important works, including very significant texts on the profoundest philosophy known to Buddhism: the devoid of other (shentong) view. This represents the zenith of the Middle Way (madhyamika) school of mahayana Buddhism and is a valuable antidote for misunderstandings of voidness. He expounded this view at length and debated it with scholars of other Buddhist tendencies. Michö Dorjé was also a visionary artist, to whom we owe the Karma Gadri style of thangka painting--a very spacious, transparent and meditative style. He also composed one of the main devotional practices of the Kagyu school, known as the Four-Session Guru Yoga. He had been invited to China when quite young, but declined, knowing that the emperor would be dead by the time of his arrival. His refusal offended the envoys carrying the invitation, who returned to China only to find that his prescience was correct. The emperor had died. Realizing the imminence of his own passing, he entrusted a letter of prediction to the Shamarpa and passed away at the age of 47.